It’s not uncommon for older adults to feel unsteady on their feet and fall, but doctors in Northern Ireland discovered a surprising cause of one man’s balance problems: a large pocket of air inside his skull which made it look like part of his brain was missing. The 84-year-old first went to his primary care physician complaining of recurrent falls and feeling unsteady over several months. He had also developed weakness in his left arm and leg. The man did not report confusion, facial weakness, or visual or speech disturbance, and said he was otherwise feeling well. Doctors didn’t note anything unusual in his medical history or blood work. A CT scan of the man’s brain was ordered and doctors were shocked to see what appeared to be a gaping hole in the man’s brain. 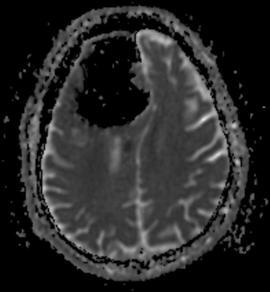 Diffusion-weighted MRI of the patient’s brain. Brown and co-author Dr. Djamil Vahidassr document the case in a recent edition of the journal BMJ Case Reports. The mysterious “hole” turned out to be an air-filled pocket called a pneumatocoele, which had been compressing the patient’s brain tissue. The doctors note in the report that these air cavities are more common in people who have had facial injuries, sinus or ear infections, or who have undergone brain surgery. However, an air cavity of this kind is rare. An MRI also revealed that the patient had a benign tumor in the part of the skull that separates the brain from the nasal cavity. Doctors determined that this tumor wore away part of the man’s bone, which allowed air to be forced into the brain “by creating a ‘one-way valve’ effect,” the report states. Additionally, the MRI showed that the man had suffered a small stroke related to the air pocket in his brain. Doctors offered to perform surgery to remove the air from the man’s brain, but after taking into account the benefits versus the risks of such a procedure, the man opted out. He was treated with a statin and anti-clotting medication to lower his risk of having another stroke, Brown told LiveScience. At a 12-week follow-up, the patient reported feeling well and the left-sided weakness was gone.